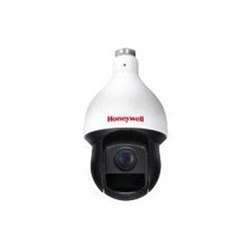 Honeywells new HDP302DQI PTZ dome camera provides extremely crisp video at up to 30x zoom for continous surveillance in indoor or outdoor environments. Employing Honeywells HQA technology, it delivers full HD images over existing coax infrastructure. The camera features a 4.5-135mm lens, 30x zoom, 4 high power IR LEDs, a 1/2.8" CMOS sensor, true day night, WDR, PTZ and 1080p resolution.